Water is a natural occurring substance that contains two atoms of hydrogen and one atom of oxygen, held together by covalent bonds. It exists in gaseous, solid, and liquid states and has several distinctive properties; it is a universal solvent, it is cohesive, and it is adhesive. It also has surface tension, polarity, electrical conductivity, and a neutral pH. A solvent is a substance that is capable of dissolving other chemical compounds. Water is called the universal solvent because it can dissolve more substances than any other common liquid. For example, water can break salts into their component ions, hydrate the ions, and prevent them from interacting. Most chemical elements have high solubility in water, meaning that a large amount of the element can build up in the water before the water molecules' capacity to isolate additional ions has been met. When there are no more water molecules available to isolate a substance's ions, the mixture has reached the point of "saturation." At the point of saturation, the mixture begins to form solid precipitates. 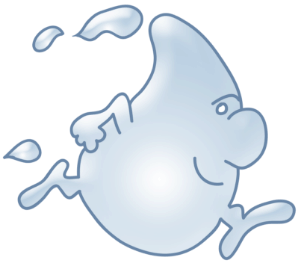 Facts and Figures about Water: This page contains a lot of different facts about water. Structure and Quality of Water: This article discusses the important qualities of water. Water, the Solvent for Life: This page talks about water's role as a universal solvent. Water, the Miraculous Solvent: This article details many physical properties of water related to its solvency. Water as a Solvent: This is a page with notes from a textbook that discuss water as a solvent. Water has polarity, which means that the charges on each end of the molecule are not equal to one another. These unequal charges are caused by an unequal distribution of negatively charged electrons. Electrons are unequally distributed across the water molecule because the oxygen portion of the molecule attracts more electrons than the hydrogen portion. Therefore, the side of the molecule with the oxygen atom is more negative than the charge on the side with the hydrogen atoms; this causes the water to have several strange properties, including high surface tension. The Properties of Water: This page discusses the polarity of water and several other properties. Polar Covalent Compounds: This article covers covalent bonding and describes its relationship to water. Polarity of Simple Inorganic Compounds: This page explains polarity in detail. What is Water? : This article talks about water, its polarity, and some of its other properties. Polarity of Seawater: This page discusses the polarity of saltwater. Water is both adhesive and cohesive. Adhesion is a force that holds the molecules of a liquid to other surfaces. This occurs in water because water molecules have polarity; the positive end of each molecule can form a bond with negatively charged surfaces. Cohesion, on the other hand, is a force that holds molecules of a liquid to other molecules of the same liquid. This occurs in water because the positive side of each water molecule can bind to the negative side of another molecule. Water Properties: This is a page that discusses certain properties of water, including adhesion and cohesion. Adhesion-Cohesion: This article talks about water's cohesion and adhesion properties. Cohesion: This page defines cohesion. Adhesion and Cohesion: This page provides diagrams to help students understand adhesion and cohesion. Cohesion and Adhesion: This page provides concise definitions of cohesion and adhesion. Surface tension occurs when a liquid's surface is in contact with a gas and forms a thin sheet that is harder to penetrate than the liquid beneath it. Water possesses this property because cohesive forces are pulling its molecules in every direction except upward. This creates a skin-like surface on the water. It is this property that allows certain objects, such as paperclips, to float on water. Surface Tension: This is an article that describes water's surface tension. Surface Tension and Bubbles: This page discusses surface tension and its applications to the formation of bubbles in water. Surface Tension of Water (PDF): This article describes the mechanism that causes surface tension in water. Surface Tension Article: This article details surface tension in-depth. The Surface Tension of Water: This article describes surface tension and provides examples. Electrical conductivity is a measure of the ability of a substance to conduct an electric current. The more ions a substance has dissolved, the higher its electrical conductivity; because water is the universal solvent, it is considered a good conductor of electricity. Water that has a higher concentration of salt ions is usually a better conductor than water with a lower concentration of salt ions. Chemical Analyses - Electrical Conductivity: This page explains electrical conductivity. Electrical Conductivity and Resistivity: This article defines electrical conductivity. Conductors and Insulators: This page explains the difference between a conductor and an insulator. Factors Influencing Electrical Conductivity: This article explains what properties of a substance cause it to become a good conductor. Conductivity: This page explains electrical conductivity and describes its connection to water. PH is a measure of how acidic or basic a substance is. Possible pH values range from zero to 14, with 0 being the most acidic and 14 being the most basic. The pH of water is typically around 7, this means that water's pH is neutral and it is neither acidic nor basic. Water Chemistry: This is an article that includes information about many of water's properties, including pH. What are pH and Electrical Conductivity? : This page defines both electrical conductivity and pH. What is pH? : This article describes pH, acids, and bases. pH Scale: This page explains the pH scale. Water Quality - pH and Alkalinity: This article talks about the relationship between a water's quality and its pH.